Teaching spelling takes a lot of time because it requires extensive spelling practice. LearnThatWord is an online tutoring program that complements your efforts in the classroom, providing targeted and effective assistance. We then practice problem words until they're learned for good. 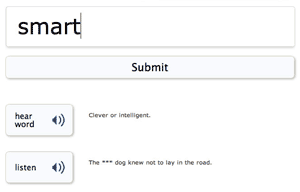 Every spelling test is personalized, creating a custom learning journey for each member. Let LearnThatWord help you with "." We determine which spelling words need more practice and then review them until they're learned for life. Every session is custom-designed, so it works for all ages and all students, from the struggling to the advanced. Start a free teacher account here. Choose a username that is easy to remember as it will turn into a 10% coupon code for your students. Then, join our tutor partner program! Personalized, smart, effective Find, modify and create lists! About us: LearnThat Foundation is a 501(c)3 nonprofit corporation, committed to empowering people, one word at a time.